The Eagles improved to 5-6 by beating UConn, 30-0, Saturday. Win or lose this weekend at Wake Forest, Boston College will probably be returning to a bowl game. The Eagles (5-6) can guarantee themselves a spot with a win over Wake in their season finale, getting the six wins needed to become bowl-eligible. But even if the Eagles fall in Winston-Salem, picking up their fifth win with a 30-0 blowout over Connecticut last Saturday might have been enough. In the event of an “insufficient number of deserving teams,” the NCAA allows room for schools that have five wins plus a multiyear football Academic Progress Rate score high enough for postseason play. With 64 teams already bowl-eligible going into Week 12, that leaves 16 bowl spots still open. 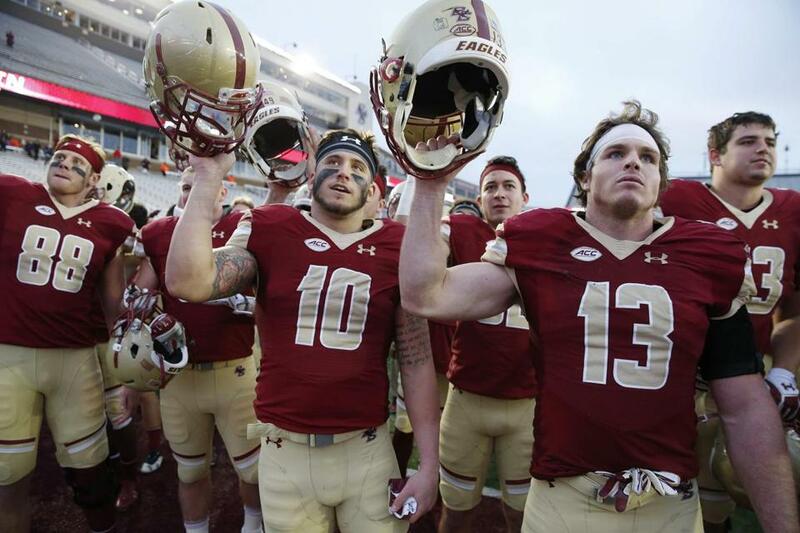 BC is one of 18 teams a win away from being bowl-eligible. (Army has won six games, but two were against FCS opponents, and it still needs a win over Navy to become eligible). Of those teams, nine are favored to win this weekend, which could leave seven bowl spots for 5-7 teams. With a 981 APR, BC would easily qualify. The only five-win teams in the country with higher APRs are Vanderbilt (990) and North Texas (984). Duke is sitting on a 4-7 record with a 995 APR, but it goes into Miami as a 15-point underdog. The Eagles have never gone to a bowl with fewer than seven wins, but playing in one even as a 5-7 team has value,coach Steve Addazio said. “Obviously to go win this game and get to a bowl game buys us more time, buys us continued momentum, but nothing is going to stop that from growing right now,” Addazio said. “They’ve seen that and tasted that. Now they know it. For a program bouncing back from a 2-10 season a year ago, returning to a bowl game would be a tangible sign of progress. “Of course, the obvious is you continue to play one more game,” Addazio said. “It’s kind of a marker, going to a bowl. It’s a goal you set in the beginning of the year. It’s one that’s still alive and it’s a marker because it’s a marker for success and then it’s a marker for growth and development. For Addazio particularly, playing in the postseason would be affirming. The only two coaches in BC history to lead the Eagles to bowl games in three of their first four seasons were Tom O’Brien and Jack Bicknell. The success of those coaches was much different. Bicknell never lost more than three games in a bowl year and had the Eagles ranked as high as fourth in the country. O’Brien’s run of eight straight bowl appearances from 1999 to 2006 is the longest in program history, and he never won fewer than eight games during that span. But before Addazio was hired in 2012, the Eagles had sat out bowl season in back-to-back years after playing in 12 straight. The 2-10 season in 2015 and blowout losses this season cast a pall over much of that progress. “I think it speaks to the fact that we took over a program that when I came here we knew this would be up to a five-year rebuild,” Addazio said. “If we can do that, that sets a marker for getting there, you know, three out of four years. So that’s important. The question remains whether returning to a bowl game also means returning to respectability. After going 0-8 in the ACC last year, the Eagles this year dropped four games to conference opponents by 30 points or more. They snapped a 12-game ACC losing streak, but an eight-game skid against ranked teams lives on. A win over Wake Forest (6-5) would be their first win over a bowl team since they beat Northern Illinois early last season. But within the program, Addazio said, those disappointments haven’t stunted the growth. “This team has had a lot of resolve,” he said. “I think they love football and have seen growth on the tape. There have been disappointments now, we all know that. “But never did I ever one time feel like we’ve got to pump this thing up, because I think that they feel good. This isn’t coach talk now. “They feel good about where we’re headed. When they don’t, that’s when you get that kind of look sometimes. But that’s not the case here. “There have been major disappointments. We had a couple hard points in the season . . . but it certainly wasn’t deflating.